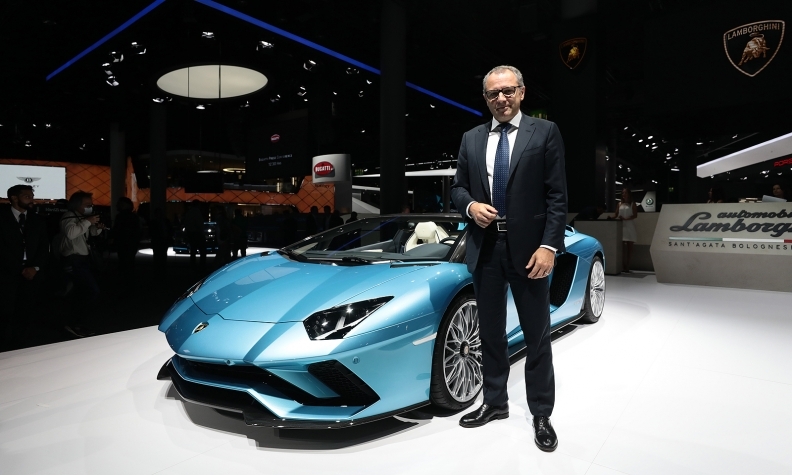 Lamborghini CEO Stefano Domenicali with the Aventador S Roadster at the Frankfurt auto show. FRANKFURT -- Ferrari and Lamborghini are working on hybrid versions of their sports cars but have no plans for now to develop wholly electric models, executives at the two companies said at the auto show here. Michael Leiters, chief technology offer at Ferrari, said he could not imagine a full-electric Ferrari sports car given the current limitations of the technology. "There is a need for more time, more innovation to get the same performance, and, what's even more challenging, to get the same driving pleasure that we have today," Leiters told reporters. "Just think of the sound and things like that which are essential for us. For us the first step is hybridization." The comments were echoed by Stefano Domenicali, the CEO at rival Lamborghini, who said the company would put energy into developing hybrids, but also seek to fully exploit the potential of its V-10 and V-12 naturally aspirated engines. "I don't see electric to be an immediate development in the super sports car segment, but hybridization for sure will come, in the next five years for sure," he said. Lamborghini is preparing for the official launch of its first SUV, the Urus, on Dec. 4. Shipments of the new model are expected to start during the summer of next year. The SUV is not only expected to double Lamborghini's overall annual sales volume, which stood at 3,457 last year, but will also give Lamborghini access to new markets such as Russia and India, Domenicali said. "There are these and other markets where we will enter with this product and believe to be strong," he said, adding the vehicle would be priced at around 200,000 euros. Lamborghini sold a record 2,091 vehicles in the first half of this year. While deliveries in the second half are expected to be slightly lower due to seasonal factors, Domenicali said he expects year-on-year growth for the entire 12 months would be a single-digit percentage, "close to double digits." 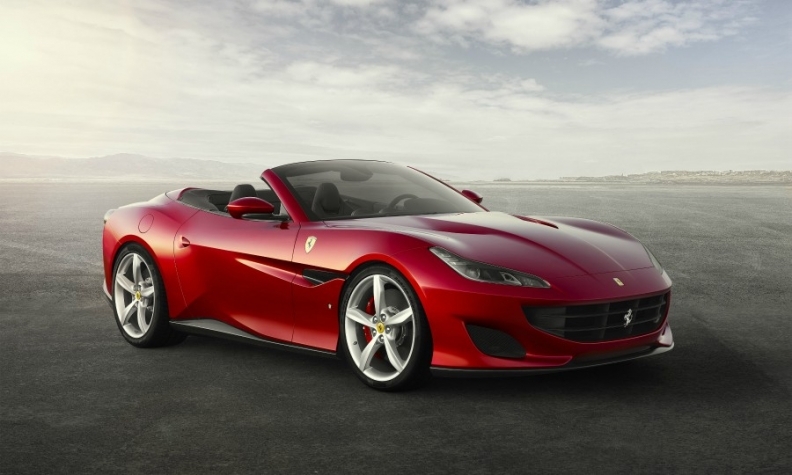 Ferrari presented its new entry-level model, the Portofino, at the Frankfurt auto show. Ferrari on Tuesday launched the Ferrari Portofino, its new entry-level model that will replace the California, and will be sold in Italy at a price of 196,000 euros. Named after a picturesque village on the Italian coastline, the convertible Portofino is powered by an eight-cylinder GT engine and can reach maximum speeds of over 320 km per hour. Ferrari plans to start deliveries of the car in Europe at the end of the first quarter and in other markets by the summer, said Chief Marketing and Commercial Officer Enrico Galliera. The initial reaction boded well for sales, he added. "The reception to the car even before its official launch exceeded our expectations. Almost all the dealers have strong order books for the car already," he added. Galliera reiterated Ferrari would never make an SUV like the one developed by Porsche or Maserati "because these aren't vehicles that represent the sportiness of our cars." The company also ruled out a self-driving Ferrari. But Galliera also referred to comments made recently by Ferrari's CEO and chairman, Sergio Marchionne, who said the company was working on an entirely novel vehicle. "It won't be like anything that's on the market today so it would be wrong to give it a label," Galliera said.